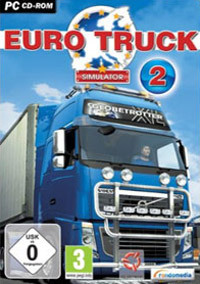 A sequel to the popular truck simulation game. Just like its predecessor from 2008, the game was developed by Czech developer SCS Software. Euro Truck Simulator 2 lets you play as a truck driver and owner of a delivery company. Euro Truck Simulator 2 is the second installment of a simulator game series from SCS Software, in which you take the wheel of massive trucks. The title introduces a number of improvements as compared with its predecessor, which aimed to make the gameplay more realistic. Fans of this type of games may find it useful to know the game was created by the same people who had previously worked on, among other titles, Hard Truck 18 Wheels of Steel - another product of the genre. While working on their game, the authors focused mainly on adapting it to the tastes of the European consumers. As a result, for the second time players can travel across thousands of kilometers of roads stretching across the Old Continent and visit many well-known cities. As always, the game involves delivering cargo to its destination, the sooner the better, and showing off your truck driving skills on the way. The developers took care of getting licenses of known brands, so you can drive vehicles manufactured by Mercedes, Scania, and many others. Therefore, individual trucks resemble their real-life counterparts. You can also freely modify their appearance, as there is an option of mounting new halogen lamps and other elements, as well as change painting. The developer put emphasis on simulation aspect, which can be felt e.g. thanks to the driving model. For the lovers of the genre the biggest fun is to drive while in cockpit view when immersion is the strongest. The creators also managed to adapt the truck controls to pad buttons, so the game is also accessible for players who use this type of controller. Significant changes were made to visuals that are now running on an entirely new engine. The most noticeable thing is much larger world with more cities to visit. The authors saw to it that the most important elements of each metropolis were present in the game, therefore, some places can be recognized at first glance. Also the technical aspect was improved – better shading and HDR effects, which were missing from the previous installment, were added. The whole thing was optimized in such way as to make the game work well on some slower computers, however, that involves lowering graphic details. Game score 8.315 / 10 calculated out of 6090 players' votes. Expectations before the premiere: 9.1 / 10 calculated out of 5668 players' votes. The Euro Truck Simulator 2 walkthrough presents the carrier stages, driver's carrier paths and tips on how to employ a good driver.